Blanketweed or string algae is a big concern for many pond keepers. 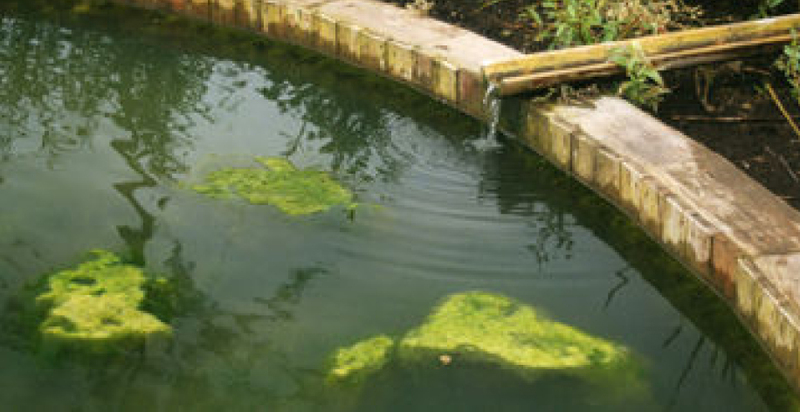 Green water is another unsightly algae problem, making a pond resemble pea soup. Blanketweed is another type of algae that forms an unsightly and smothering ‘blanket’ across the pond surface and throughout the pond. Blanketweed floats because of the oxygen that is trapped within it buoys it up. Blanketweed can smother a pond in days in perfect summer conditions, causing pumps to block up and submerged plants to be choked. Blanketweed thrives in clear water ponds, that are typically fitted with a UV clarifier. Blanketweed is best controlled by addressing the cause – which are the combination of nutrients (nitrates and phosphates), warm pond water and bright sunlight. It is fair to say, that blanketweed is the scourge of the koi pond. Designed, constructed and maintained for their beauty, never was a weed so out of place as in an ornamental pond – particularly when stocked with koi. koi ponds have risen to become one of the koi keeper’s most common complaints. The Evil Weed … Blanket: “Heavy or dense covering”. Weed: “A herbaceous plant, not valued for use or beauty”. Blanketweed and Nishikigoi share two things in common: They both have names that accurately describe their physical features. They are rarely seen apart! It is fair to say, that blanketweed is the scourge of the koi pond. Designed, constructed and maintained for their beauty, never was a weed so out of place as in an ornamental pond – particularly when stocked with koi. Where the presentation of living beauty is the prime objective, anything that detracts from such a masterpiece is definitely a misfit and blanketweed is the number 1 offender. Nishikoi’s “Goodbye Blanket weed” Goodbye Blanket Weed ..
We don’t resent blanket weed’s grip on our ponds because it poses a direct threat to the health of our koi, as in fact, it can actually lead to improved water conditions. When there is a thin, beardlike covering on areas of the pond, koi will browse and graze on the soft, lush growth. However, koi find it less appealing when the beard has grown into lengths of weed several feet in length (hence its other names such as hair or thread algae). Blanketweed will also provide an excellent nursery, both feeding and protecting developing koi fry. Furthermore, blanketweed is beneficial to a pond in that it will very actively take up minerals and nutrients from the pond water (just like a vegetable filter), the only difference being that this one is in the pond! So vigorous is the growth and uptake of nutrients by blanketweed that should we find a way of confining it to a vegetable filter, it would be our number one plant choice. Unfortunately, like all other weeds, blanketweed does not know its right place and freely enters any koi pond, doing so at its own risk, as its presence is likely to be challenged. Another redeeming feature is that blanketweed is a very effective oxygenating plant. Its fine filament structure and submerged position lend it to producing a ready supply of microscopic oxygen bubbles. So intense may be its aerating effect that in strong sunlight, rafts of blanketweed will rise up to the surface, buoyed up by the mass of oxygen bubbles caught within its filaments. So are we simply aesthetic snobs when it comes to disliking blanketweed? Blanketweed can pose an indirect threat to koi health through blockages in pipework or pump intakes caused by fragments of blanketweed. This may merely reduce the pond turnover, or even lead to blockages in a bottom drain. In extreme cases, I have known that people have thought twice about going on holiday through fear of what blanketweed may do to their pond in their absence. Blanketweed – what is it? Blanketweed is a collective term given to a number of very similar algae that both look and behave identically. The most common genera are Cladophora and Spirogyra. Cladophora means ‘branched plant’ and when viewed under the microscope, it is possible to see the regular-branding filaments, each of which is divided by cross walls. Absorption of light and nutrients is very efficient in such small structures and so growth can be incredibly rapid. They reproduce both sexually (releasing gametes that unite and develop into new plants), and asexually (releasing small motile spores or simply smaller fragments that break off from the main body). 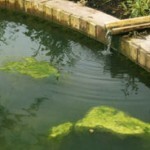 Ponds in full sunlight are most likely to be affected. Light is required to fuel the process of photosynthesis, which allows these algae to produce organic molecules for new tissue growth. Growth is also particularly rampant in shallow areas where the water is exposed to intense sunlight. Algae will readily absorb nitrates and phosphates to satisfy their need for nitrogen and phosphorous as they grow. These are readily available in tap water or indirectly through fish metabolism. Wherever nutrients abound, so will this opportunistic algae, being the first to capitalise on ideal growth conditions. A high temperature will accelerate algae growth considerably and blanketweed growth will be greatest in the shallower areas such as cascades and waterfalls and along the pond perimeter. Blanketweed will find your pond. Many pond owners are fortunate in that, blanketweed does not appear to proliferate in their ponds (and they cannot explain why). However, the vast majority of us will find that our ponds are very hospitable to blanketweed, forcing us to look for ways of preventing it from causing problems. The answer to controlling blanketweed lies in reducing one of their 3 key requirements; sunlight, nutrients, and warmth. As we want our ponds to be as warm as possible (to stimulate koi health and growth), we must look at reducing sunlight and dissolved nutrients. Sunlight. Sunlight penetration can be reduced in a number of ways. Shading. Erecting shading on a pergola will reduce sunlight straight away and reduce blanketweed photosynthesis. It can also help against heron predation. Adding dyes. Several blanketweed and algae controls work by adding dark vegetable dyes to the pond, filtering out the sun’s rays. This will give the water a tint, and will need to be topped up when the natural dyes are broken down by the filter. Compelling natural evidence that shading works is evident when a pond suffers from green water. The microscopic single celled algae that turn a pond into a ‘pea soup’ out compete and shade blanketweed out of its valuable light. Blanketweed and green water have a mutually exclusive relationship, where ponds tend to suffer from either one or the other. Unfortunately, one of the side effects of installing a UVc (which is a guaranteed method of clearing green water), is that blanketweed will proliferate unhindered in the crystal clear, nutrient rich pond water. Nutrients. Several pond treatments are available that control blanketweed growth by locking up or removing the vital nutrients from the pond water, starving the growth of blanketweed. Upon adding to the pond, they will bind up nitrates and phosphates. Other additives will act indirectly, but achieve the same ends using micro-organisms rather than chemicals. While all other methods simply control algae growth, the addition of algicides (chemicals that kill algae), work by interfering with vital biological processes. These products are the only ones on the market able to clearly state they kill algae – all others control or reduce it. Barley straw is a green method of controlling blanketweed and green water. Upon its degradation, which can take several weeks, a cocktail of humic acids are released which react to release hydrogen peroxide, reducing algal growth. To speed this ‘natural’ process up, barley straw extract is now available. This method is reported to work on most ponds that have a suitable water chemistry by interfering with calcium ions. This apparently upsets algae metabolism, reducing blanketweed growth. Under the most favourable conditions, particularly in strong currents, blanket weed can grow over 2 metres a day. If treated correctly, blanketweed can be removed from a pond and used as a substitute for moss in hanging baskets. It swells and retains moisture, but must not be allowed to completely dry out. In the Hokkaido district of Japan, each summer there is a festival celebrating mythology about Cladophora balls, a form of blanketweed growth in a local lake. The folk lore maintains that a young man and a girl who both drowned in the lake had their hearts turned into Cladophora balls – what a way to go!